The 1903 Illustrated Catalogue is a trade catalog by Theo. A. Kochs Co., a company established in 1871. It begins with several pages of color images of barbers’ chairs. 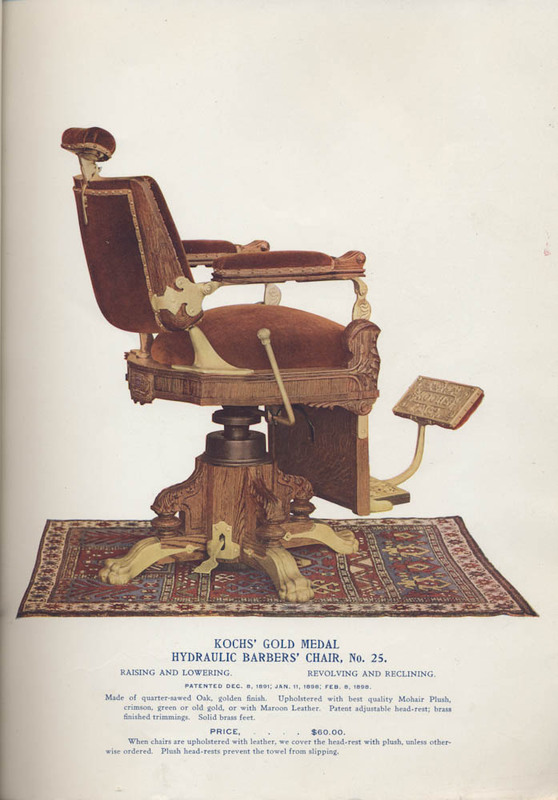 There are several models shown with three types represented–Kochs’ Gold Medal Hydraulic Barbers’ Chair, Kochs’ Pedestal Columbia Chair, and Kochs’ Columbia Chair. The upholstered chairs revolve and recline but Kochs’ Gold Medal Hydraulic Barbers’ Chairs also have the ability to be raised or lowered. One of these is illustrated below. Theo. A. Kochs Co., Chicago, IL. 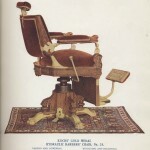 1903 Illustrated Catalogue, 1903, Kochs' Gold Medal Hydraulic Barbers' Chair, No. 25. The catalog goes on to show illustrations of mirror cases. These have built-in workstands with drawers, cabinets or shelves and, of course, mirrors. The mirror cases come with space for anywhere from two to six chairs. Also illustrated in the catalog are dressing cases which look similar to the mirror cases but with space for only one chair. Flipping to the end of the catalog, there are pages showing supplies such as eye shades, shampoo cloths, rubber sleeves for use while shampooing, barbers’ coats, and much more. This catalog and others by Theo. A. Kochs Co. are located in the Trade Literature Collection at the National Museum of American History Library. Check out the Galaxy of Images to see more pages showing images of barber shop furniture and supplies from the early twentieth century. Previous Post Welcome, Intern Tatum Lindsay! Next Post See you at ALA Annual!